"SprutCAM used during SAE competitions for off track vehicle components manufacturing"
SprutCAM has a good interface which was easy to follow. It has a vast system of tools as well as machines in it's database which makes it easy to check the machining procedure in simulation. The automatic G-code generation is a very useful feature, which also allows to set machining limits. There were some compatibility issues with the new windows version, which resolved in a couple of months. 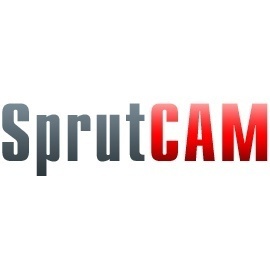 There is a lot of information and tutorials on the SprutCAM website and their youtube channel. This makes understanding the use of the software very easy. The help forums are also very useful for trouble shooting. Parts for a rack and pinion system for steering were CNC-manufactured using code generated through SprutCAM. The software's major benefits were the ability to configure the code to the CNC machine available. The simulation tab also allows to make sure the process is going to complete without any issues. "Good manipulation of the 3D data "
"One of the best softwares which I have used"
The best thing which I have liked is the user interface and it is better than most of the other software. It is not multidisciplinary. It should have all the options. There are some that which I disliked as I didn't know about most of the options given in the software. There should be a help type of command which will tell us about all of the things which are there in it. It is better than most of the software available in the market. I will highly recommend it. I have designed a roll off trailer using this software. Then I generated the code for matching. It was good as compared to other software which I have used in the past. The software was pretty easy to get set up and running. Being able to test it before committing to it was a big plus. Over all I think the UX is decent but could use some help modernizing it. Their isn’t a whole lot to dislike, it is pretty full featured and did everything I needed it to. I have a pretty basic 3-axis set up. I think the UX is the weakest point overall. Try it and compare it to other software before purchasing. Mostly manufacturing jigs and fixtures from ABS and Aluminum. Some very short production runs. SprutCAM allows for the creation of beautiful graphics to visualize processes in 3D and has extremely realistic machining simulation. SprutCAM has a steep learning curve- it's difficult to begin using this software, but extremely user-friendly once you get started. SprutCAM is the best CAM program I have used, its simplicity and level of detail are unparalleled. I've used SprutCAM while working with a team in an on-campus machine shop. We've realized the benefits of being able to see the process virtually before actually carrying it out to identify potential problems we may face. SprutCAM has user-friendly interface and easy to understand if one's using it for the first time. It's speedy as well. It would be better to have more demo videos online especially of additive manufacturing. I have used for precision machining of Sterling engine components and few additive manufacturing parts. It just makes work easy. I needed to use software to create g-code for printing on a curved surface and this software helped me a lot. The SprutCAM postprocessor only defines the syntax of the CNC program, without performing geometric calculations as inverse kinematics and linearization. "Easy to use and clear instructions "
The simplicity of the product and the amazing work engineers put into it! "I dont really have much experience with it"
* We monitor all SprutCAM reviews to prevent fraudulent reviews and keep review quality high. We do not post reviews by company employees or direct competitors. Validated reviews require the user to submit a screenshot of the product containing their user ID, in order to verify a user is an actual user of the product. Hi there! Are you looking to implement a solution like SprutCAM?